There are days when I keep looking and nothing strikes me enough that is worth sharing with you all and then there are days like this when something so gorgeous walks right up to me via my inbox! Yes its this birdie wallpaper! So pretty that it makes me wanna put it all over my house, ok! maybe not all over but don't you think it's a must have? 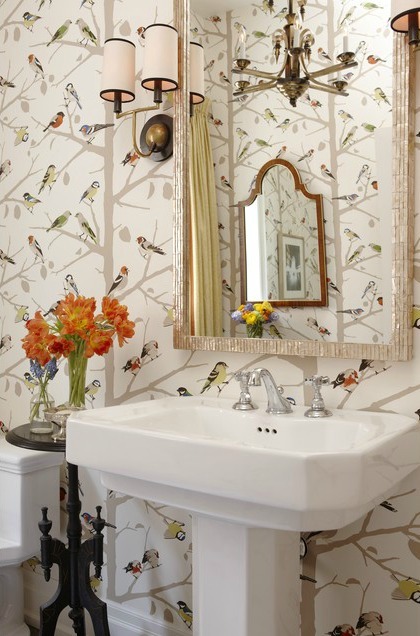 As great as it looks in this powder room, I think it could go very well in a kids room too. Not that it is kiddie or something, because it would pretty much make any room call out to you, but it being a neutral design could fit well for kids any age ie. from lil ones to teenagers. Also, if you have a home decorated in a mix of styles it could even look good in a passage or a hallway or even on the facing wall of the foyer. I guess I am just penning my thoughts as they flow, but my point is that these lil birdies would look great chirping away in any part of your house, you just got to use you imagination and as they say it...make it POP! Its beautiful idea. Go to my site kids room, teenagers room etc... also lots of idea you get.